Ok, folks, here it is, my very first CLIMBING BLOG post, prompted by the fine folks at Misty Mountain Threadworks and Blue Ridge Outdoors magazine who have been awesome enough to give me some support this year. If you’re a regular reader of past blog posts, please forgive me for a lack of overly-analytical, pseudo intellectual jargon here. I’m just going to talk about climbing. First off, just a brief summary of where I’m at right now, and where I’ve come from as a climber. As of this season, Spring of 2015, I am 36 years old. I first roped up when I was 19, which means that I’ve been climbing for nearly half of my life. 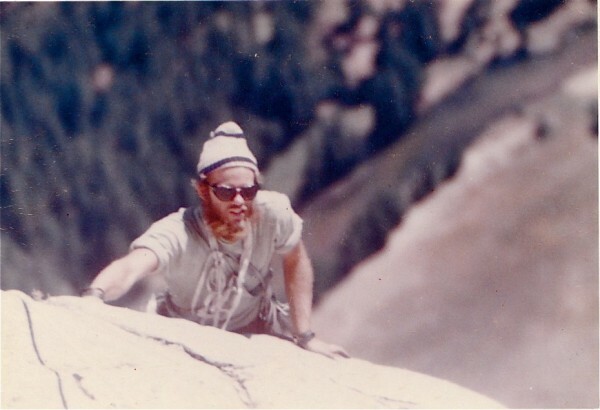 I learned first by toproping outside, and later by leading trad at Idaho’s City of Rocks and in the Southern Utah deserts. I never really spent much time in a gym until I moved to Dallas, TX for grad school in 2002, and became a regular at Exposure Rock Gym. This was the first place that exposed me to really strong plastic pullers. Dallas in particular has dozens of adolescent mutants who will scamper up your projects like cockroaches. I didn’t really do specific training, but rather just bouldered a lot, getting fairly solid in the v5/5.12 range. Much later, in 2008, I wound up moving to Columbus, Ohio, where I was easy weekend distance from both the Red and New river gorges. I also had access to an excellent co-op gym, Kinetic (which has since evolved into a great commercial facility). About this time, I began climbing with Mike Anderson, who is one of the foremost experts in climbing-specific training, and recently authored The Rock Climber’s Training Manual with his equally strong brother Mark. Climbing with Mike really opened my eyes to specific climbing workouts in the gym that went beyond just bouldering around on plastic. I won’t go into details here (you can find them on his site, or by searching “rock prodigy training”), but suffice to say that it was specific training– hangboarding, campusing, core exercises– that finally got me to break into the 5.13 range in 2011. In 2013, I left academia and opted to move to the New River Gorge, where I could put climbing and laid-back Appalachian living on the front burner of my life. My first season here at the NRG was good. I had just come off a foot injury, had really gone overboard on training upper body strength, and managed to jump back into 5.13s pretty quickly. However, eventually the lack of gym access caught up to me, and I began getting gradually weaker. It is actually really hard to stay in top shape by climbing outside all the time, especially at the NRG, where weather and hot summers can mean weeks of sub-par climbing conditions. I devoted the season of 2014 almost exclusively to trad climbing– slightly easier than my max, but much scarier. You can read about this season here. But I continued to get weaker, and by this past fall, I was wondering to myself if I had gone over the hill, in my mid-30s, with no career, and a mediocre climbing life that was approaching the point of diminishing returns. Which brings us to the 2015 season. This past winter, I took a month roadtrip to the desert Southwest, which I had not done for a while. 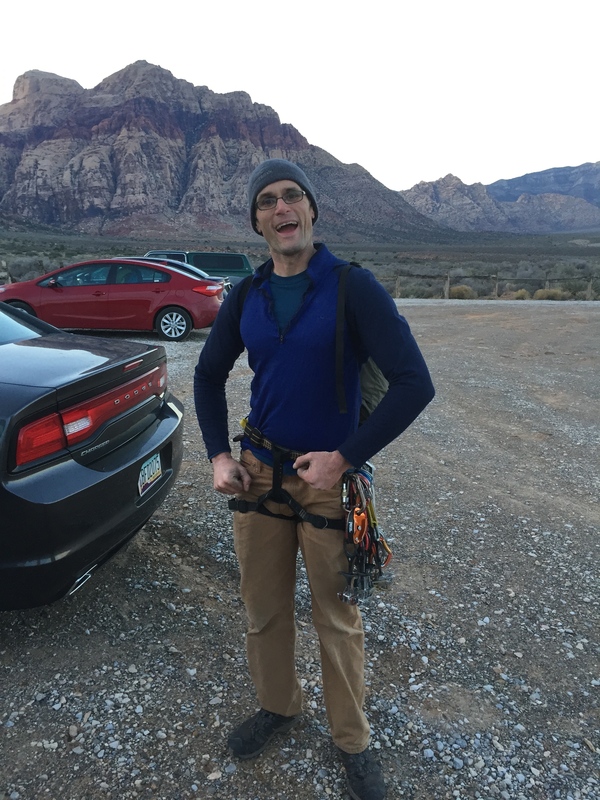 Scenery, adventure, and new routes took precedence over physical difficulty, and I mostly focused on big, 1000+ foot routes in Nevada’s Red Rock Canyon. It was amazing to say the least, and got me in better cardio shape than I’ve been in a long time. However, my climbing performance suffered. I don’t think that I sent a single thing harder than 5.12a that whole trip. Noobing it up at Red Rocks, NV. Perhaps the most productive thing I did this whole trip, believe it or not, was manage to get a lecture booked at Zion National Park, where I would discuss my recent book “Wrecks of Human Ambition,” a history of the red rock canyon country. And the added bonus? I’m hoping to climb Moonlight Buttress, over a dozen pitches of mostly 5.12 fingercrack, while I’m out there. This route has been a lifetime goal for me since I started climbing, and I am beyond psyched, no matter what the outcome is. Anyway, in February, I took a 180 degree turn from the wilds of the desert, and spent the month living with my girlfriend Karen at her home outside New York City. We skied, did a bit of ice climbing, and ate way too much restaurant food. However, my main climbing objective for this month was simple: SPEND TIME IN THE GYM! I knew that I was lacking the sheer, explosive power that comes easily to climbers in their 20s, and that I would have to build this, and then gradually transition into the sort of stamina that I would need for Moonlight’s grueling pitches of enduro-jamming. Don’t laugh, I really needed this gym sabbatical in a NYC winter. By mid-February, I had rediscovered my long-lost bouldering mojo, and was able to do v7-8 of varying styles fairly consistently, in various gyms. I then gradually started mixing it up with more endurance sessions, in which Karen and I would go to the gym early in the morning to avoid crowds, and knock out dozens of roped routes back-to-back. Gyms are awesome! By the first of March, I had returned to the New River Gorge, and began what I knew would be a rough transition to applying my gym fitness to the subtle weirdness of Nuttal Sandstone. I also began a quick, controlled calorie restriction diet that would allow me to drop 6-7 lbs in this final phase (it was nice to train bouldering power while I was a bit heavier, and eating awesome food in NYC). It’s been a bit challenging, but I think that things are starting to fall into place. I’ve gotten solid on all the vertical, techy 5.12s of Endless Wall that I love so much, and also thrown in some steep, endurance routes just to get me used to operating under a full pump, which will be key on Moonlight Buttress. The best possible training for Moonlight would be massive laps on single pitch cracks at Indian Creek, but I can’t complain with what I’m working with here. Just yesterday, I really felt that my endurance was coming together, when I managed to redpoint a new 5.13a second go, and then cooled down by running a lap on a 5.12+ that I had previously sent two days before. It felt good. There are three other 5.13 routes in the area that I have whittled down to one-hangs, and will hopefully send this spring. Anyway, I’d like to wrap up with a brief list of various goals for this year. The big one is Moonlight Buttress, and honestly even the single pitch projects I have here at the NRG are just “training” for it. But here are a few other things I’ve got on my radar. Here’s to hoping I can squeeze one more good season out of my mid-30s! 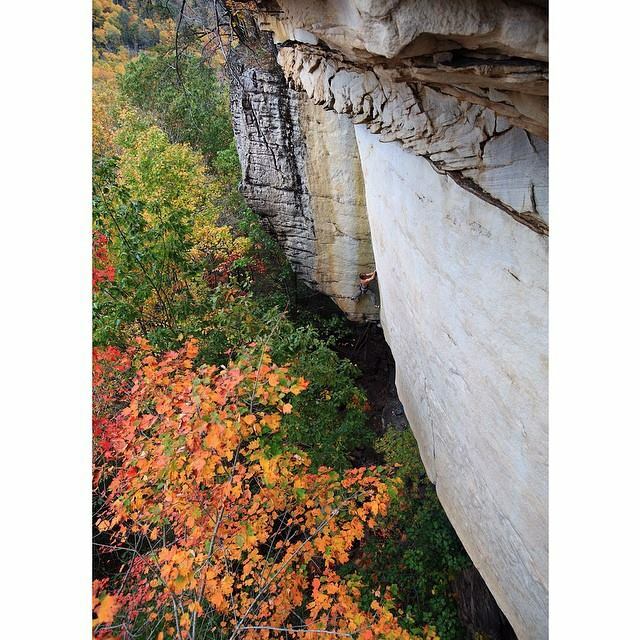 The Racist, 5.13b, Endless Wall, New River Gorge: Not gonna lie, this thing is beyond me right now. Despite the fairly “low” grade, this climb gets done way less than the popular 5.14a “Proper Soul.” I’ve gotten gradually more comfortable with the reachy, intricate, and small holds of the lower 2/3s, but the upper two cruxes are still going to take a lot of work. Adding to this, the route gets sun most of the day, and is pretty much a winter route. May have to give it a rest until November, but if there is one route I’d love to throw myself at dozens of times, it is this one. Greatest Show on Earth, 5.13a trad, Meadow River Gorge, WV: This thing is beautiful, and I think that my bouldering over the winter is finally making its core-intensive roof crack sequence a possibility for me. It is going to take a lot of work, though, and definitely is one of the hardest traditional lines I’ve put time into. Thundering Herd, 5.13b trad, Beauty Mountain, NRG, WV: I toproped this a couple times in January, and while it gets a higher grade than “Greatest Show,” it is much more straightforward. No lead attempts yet, but my last time on it while solo toproping, I managed to climb the entire crux sequence, which basically comes down to two v6 boulder problems separated by an all-out glory dyno and great jug rest. Unlike quite a few of Pat Goodman’s other FAs, this one is fairly safe to lead. BONUS: Glass Menagerie, 5.13a trad, 8 pitches, Looking Glass Rock, NC: This is another longterm lifetime route. I bailed on it last year due to wetness, bad ropework, and, errr, a few other things I don’t want to talk about, but if I manage to keep my fitness through the spring, this might be fun to go work on in May. So, there it is, my throwing-down of the gauntlet for Spring 2015. Stay tuned for my follow-up post where I complain about being weak, and the rock being too slippery. I clicked the link and read your write-up of your Color Blind lead – awesome! I don’t know why, but something about what you wrote hit me hard in a really good way…challenged me and made me think about some things that needed to be thought about. So thanks. Keep crushing and writing! The “Glass Menagerie” wasn’t that the route that some girl did the FA of not too long ago? I remember seeing it in Rock and Ice. Jen or something? What a Little Moonlight Can Do….